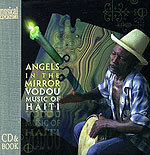 CD review: "Angels in the Mirror: Vodou Music of Haiti"
This review first appeared in the December 13, 1997 edition of the American Reporter. Like the Santeria religion of Cuba, Haiti's Vodou (or voodoo as it is often spelled in the States) is a charming mix of Roman Catholicism and the African-derived religions of the slaves. But let's face it  vodou is not widely understood in this country. Most Americans' only exposure to vodou was in a James Bond movie, "Live and Let Die"  kind of like if your only exposure to Catholicism was "The Exorcist." So Ellipsis Arts  increasingly the premier world beat label  aims to fix that lack of knowledge with the latest installment of their Musical Expeditions series, "Angels in the Mirror: Vodou Music of Haiti." As with all Ellipsis Arts projects, the book-and-CD package is an incredible value. There are essays and artist biographies, full-color photos that could have come straight out of National Geographic  and music to stir you to your soul. In the case of vodou, the music is heavily influenced by African traditions. The songs are defined by their rhythms rather than the Western concept of melody. The vocals have the back-and-forth call-and-response common to many African traditions. If there's a weakness to this release, it's the liner notes by Elizabeth McAlister. Rather than simply sharing her knowledge of Haiti and its people, she apparently feels compelled to also share her anti-Western bias in which she blames slavery strictly on Europeans, ignoring the role Africans themselves played in that ugly chapter of history. A little too politically correct for such a wondrous celebration of music, you know? But that's a minor complaint against what is otherwise a knowledgeable, loving exploration of a little-understood culture and philosophy.